Jim wanted to buy some groceries online and he was surfing for the best deal. He signed up to a local website and started looking for products he wanted to order. As the website was slow to load, he searched for another grocery shopping website and could place an order within a few minutes. If you own an eCommerce store, it is important to check the speed of the site. It matters a lot as no one would like to make a purchase from a website that is slow to load. You could be losing a lot of business with a sluggish website as nobody wants to waste a time in today’s busy world. Think about it! A fast loading website can have a positive impact on your search rankings too. Magento 2 is a popular eCommerce platform that is used by many web owners to create user-friendly web stores. Website owners should optimize their Magento 2 store to ensure success. These five proven tips can enable you to accelerate your Magento 2 site. Before you start working on optimizing Magento 2 website speed, you should check all the third party extensions that have been installed on your website. Several Magento 2 extensions are available for free, while some others are paid. Some Magento 2 extensions may not be developed for optimization and when installed, they may slow down your website. It is important to check the speed of Magento 2 website whenever you install any third party extension. It can be a good idea to turn off the extension and check the speed. If you feel that the website is faster after turning it off, then you can get in touch with the extension provider and discuss the same. You can ask the providers to replace it or fix the issue. The server is a key factor that determines the performance of a website. If the server does not function properly, you cannot have a fast loading website. Investing in a good hosting provider becomes crucial when you have an eCommerce website so avoid choosing free or shared hosting. If you do not have a problem with the budget, you can opt for a dedicated server or VPN. CDN is a system of distributed network services that provide web content to the users according to the geographic locations. It also helps the visitors load the web pages faster. After that, you can insert your HTTPS URLs to speed up your website. eCommerce websites have a lot of images and banners for attracting the attention of the target users and display the products. Images can affect the website’s performance. It is important to use compressed images for less data usage and faster page loading. For product images, you should use JPEG format. Logos on the website can be used in PNG or SVG format. 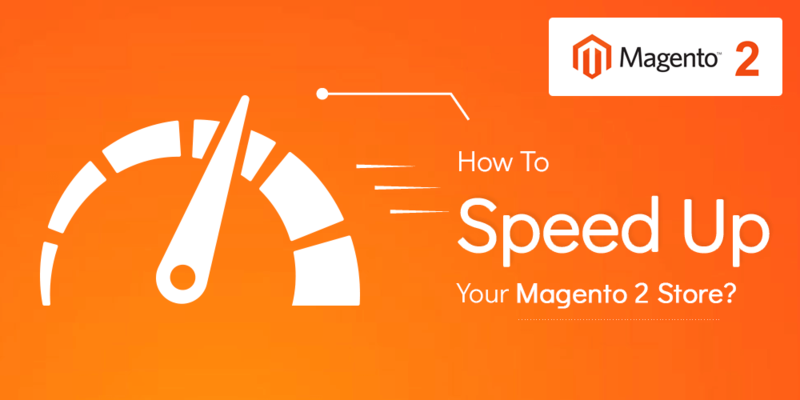 One of the major problems with Magento is the read speed of the database. If your Magento 2 website has a lot of products, then you may face the problem of slow loading website. You can enable flat categories and products to increase the read speed of your database. It helps to reduce MySQL query complexity and improves the performance of your website. How to enable flat options? These are some little tips to optimize via MySQL configuration. MySQL has its own “query cache” that it uses in Magento to help generate dynamic pages and content while improving performance. These are some recommended settings for your my.cnf file. At last, This is a suggested setting for php.ini. Magento comes with a built-in caching module. Make sure all Cache Types are enabled by navigating to “System” → “Cache Management”. You should run Magento in production mode once it is deployed to a production server. Production mode provides the highest performance in Magento 2. The most important aspect of this mode is that errors are logged to the file system and are never displayed to the user. In this mode, static view files are not created on the fly when they are requested; instead, they have to be deployed to the pub/static directory using the command-line tool. The generated pages will contain direct links to the deployed page resources. While optimizing the Magento database, you can also check your Magento project’s var/log directory. Sometimes it has around 200MB size so it is time for cleaning. Please take a backup first of that directory in case of rollback. NOTE: Make sure that when you run the below command, you must double check that you are in your Magento project’s var/log directory. Magento team constantly works on improvements of performance. You should not miss out any updates and ensure that your eCommerce store is upgraded as per the latest version of Magento 2. You can look for expert Magento web development company to help you update your website. There can be several reasons why your Magento website is slow. It is important to identify the reasons and check all the factors to ensure the high speed of your eCommerce website. If you do not know how to check the above-mentioned points for your website, you can look for expert Magento developers to help you. Hire the best Magento 2 web development company to make your website fast loading. Mayur Dhudasia is a technologist, leader and the head of Magento development team. He has more passion than his experience. He has a happy smile in his face always! Thanks for sharing this useful post !! This is really a informative post For all web developers. Very Useful Idea For Web Developers and Designer. 1. Try to Use Light-Weight Theme so that it will not affect the store’s speed much. 2. As Magento is the powerful e-commerce platform so your store has to be hosted on a reliable and fastest hosting. Hi there! I could have sworn I’ve been to this site before but after reading through some of the posts I realized it’s new to me. Anyways, I’m definitely glad I found it and I’ll be book-marking and checking back frequently!